We have about a dozen new haiku films on hand for this year’s HaikuLife, but we can always use more. We look forward to sharing your HaikuLife, video haiga, or other haiku video production with the haiku community. Please send us your videos as soon as possible so we can get them prepared for screening. FUJI CONCEALED IN A MIST. Into a sea of mist wither hath Mt. Fuji sunk? This poem, included in W. G. Aston’s Grammar of the Japanese Written Language (1877) without ascription, is possibly the first haiku ever written in English — indigenous language indeed! Amy Losak writes: I will be conducting two free Poetry Times at the Teaneck Library – my local library – on April 17. Of course, I will present H IS FOR HAIKU by Sydell Rosenberg and Sawsan Chalabi (Penny Candy Books). I also will talk to young attendees about this poetic form, and encourage them to try their hand at haiku! See the Teaneck (NJ) Library site for additional information. kjmunro writes: I am planning a launch event for my first full-length collection, contractions (Red Moon Press, 2019), for 17 April 2019 in Whitehorse, Yukon Territory, Canada. JS Graustein writes: To celebrate International Haiku Poetry Day 2019, Folded Word will be posting a series of three haiku on our website and Instagram feed. The haiku will be presented in calligraphy at sunrise, noon, and sunset (Eastern US). 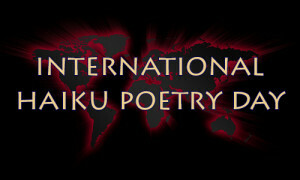 We welcome additional notifications of local haiku celebrations — just let us know! Be a part of it — celebrate International Haiku Poetry Day, April 17. In Western Australia, the Paperbark Haiku group is holding a ginko and haiku gathering to celebrate International Haiku Poetry Day. Details are on the Australian Haiku Society website. As I read it, 2012 is the inaugural year; therefore IHPD 2019 is the 8th annual.